LOVE THE VI-SHAPE SHAKE? CHEW ON THIS! ViSalus has made history again! Vi Crunch™ Protein Super Cereal puts your Body by Vi Challenge goals in a bowl with the same amount of 12 grams of protein and 5 grams of prebiotic fiber that’s found in your Vi-Shape Shake! Combining our delicious Sweet Cream flavor with almond slices and added crunch, now you can chew your Challenge! 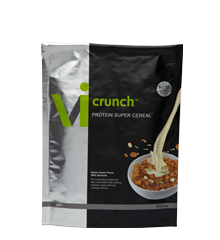 Order Vi Crunch™ Cereal & Fusions today at the ViSalus™ Online Store! Vi Crunch Super Protein Cereal combines our proprietary Fi-Sorb™ protein blend, an excellent source of fiber with prebiotics, and grape seed and rosemary antioxidants in a low fat, low sodium and no cholesterol formula that is healthy for you! Vi Crunch contains no artificial sweeteners, colors or preservatives, and is friendly for vegetarians as well as those watching their sugar intake. Here is what our Team’s nutritionist Kirk Jacobson has to say about the new Vi CRUNCH™ Protein Super Cereal: “With childhood obesity at an all time high (up 300% in the past 3 years!! ), ViSalus™ has developed a breakfast cereal that has ALL the same healthy components that are in the Vi-Shake (Vi-Shape – prebiotics, probiotics, digestive enzymes that are equivalent to eating 3 whole pineapples), patented Fibersol2 fiber and our multi-patented Trisorb triple blend of proteins that are all grown on ORGANIC farms in Iowa…..PLUS….2 ADDITIONAL ORGANICALLY GROWN PROTEINS of longer complex amino acid chain lengths!! The result is a breakfast cereal that BURNS FAT & SUPPORTS lean muscle development!!! By optimizing blood satiety (level of protein in the blood), our bodies WILL release & BURN THE FAT!!! Check this out!! Vi Crunch Protein Super Cereal is now available in two Body by Vi Challenge Kits… the NEW Fuel Kit and Crunch Kit. Check out the full line of ViSalus Products and order ViSalus Vi CRUNCH™ Protein Super Cereal today! Be among the first in the world to enjoy Vi Crunch™ Protein Super Cereal and both delicious flavors of Vi Crunch™ Fusions, three innovative new products that deliver the #1 thing you want when it comes to your health… RESULTS! If you have questions or need help placing your order, just give us a call or send us a text to 615-828-4293 or email us.